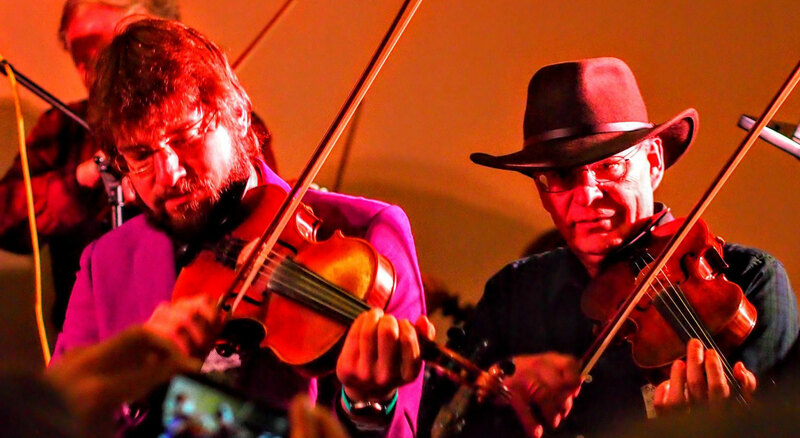 - Thanks to our Fiddle Hell photographer, Joni Lohr, for these fine photos. The Fiddle Hell Festival is a yearly gathering of fiddlers, cellists, mandolin/guitar/banjo players, and singers to meet, jam, learn, listen, and have fun. It's both friendly and diverse, crossing all ages and including many traditional musical styles. Typically, there are about 10% beginners, 25% low intermediates, 35% high intermediates, and 30% advanced players, with many workshop and jam session choices at each level. Roughly 15% of the attendees are kids, and there are some sessions just for them. 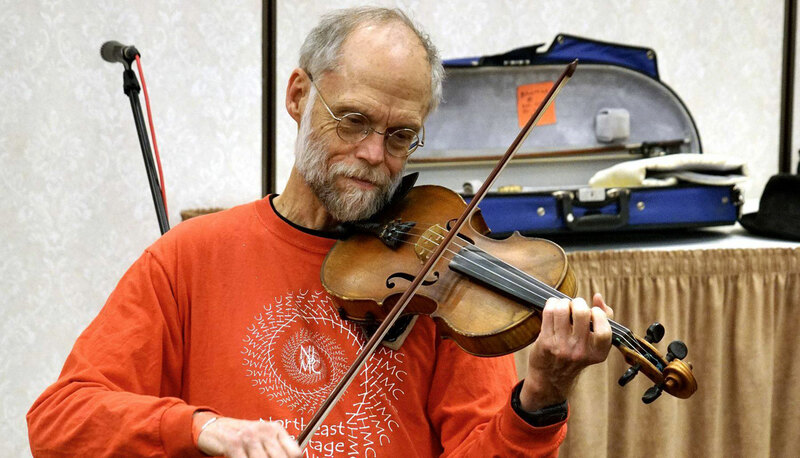 The invention of the late, great fiddler Dale Hopkins from Missouri, Fiddle Hell occurs periodically in fun locations worldwide. Prior Fiddle Hells have occurred in the US, the UK, the Netherlands, and Germany. Dale used the term "Fiddle Hell" to refer to the unique sound of many fiddlers playing a tune together. While Dale's two Fiddle Hell gatherings involved performances for the public as well as some informal sharing of tunes and techniques, Dave Reiner extended the concept to make Fiddle Hell Massachusetts more of a hands-on festival for all ages, with hundreds of scheduled workshops and jam sessions led by a wonderful group of experienced and supportive instructors, as well as more than a dozen amazing concerts. In 2018, we had 750+ musicians at the fourteenth Massachusetts Fiddle Hell. They came from as far away as Ireland, Scotland, Germany, Québec City (Canada), California, Alabama, Michigan, Texas and Florida, and from as near as Westford itself. Fiddlers are welcome, and so are mandolin players, cellists, violists, guitar and banjo players, and singers. We'll have workshops and jams for all these instruments (and for singers) again in 2019. Other instrumentalists, please contact Dave first to ask, since there is limited space at Fiddle Hell. We do request that any accompanying instrumentalists only play styles and tunes they are familiar with, and ask before joining jam sessions. This amazing gathering starts at 11AM on Thursday and goes until 6PM on Sunday (Nov. 7-10, 2019). 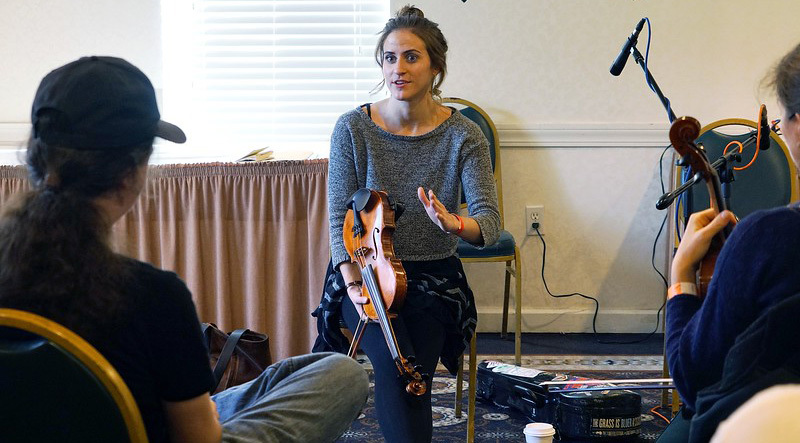 There will be more than 450 instructor-led workshops and jam sessions. Really! In addition, there will be lots of informal jam sessions, where the 52 original and 52 new Fiddle Hell common tunes may often show up. 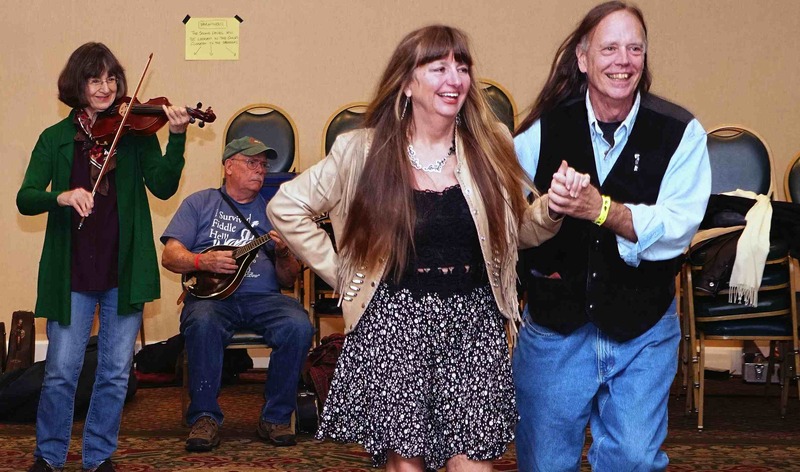 The Saturday night concert and contra dance afterwards are legendary! In addition, we'll have 12 one-hour concerts by bands and instructors. On Friday night, The Whomp! is back, and the Friday night easy contradance as well, with music by a band TBD. And don't miss the Cellosaurus Stomp Flash Mob - learn the dance here, and see the sheet music if you'd like (treble clef, alto clef, bass clef). Activities: For our workshops, the Westford Regency has many large meeting rooms with comfortable chairs. We also will use several hotel suites for the smaller sessions. 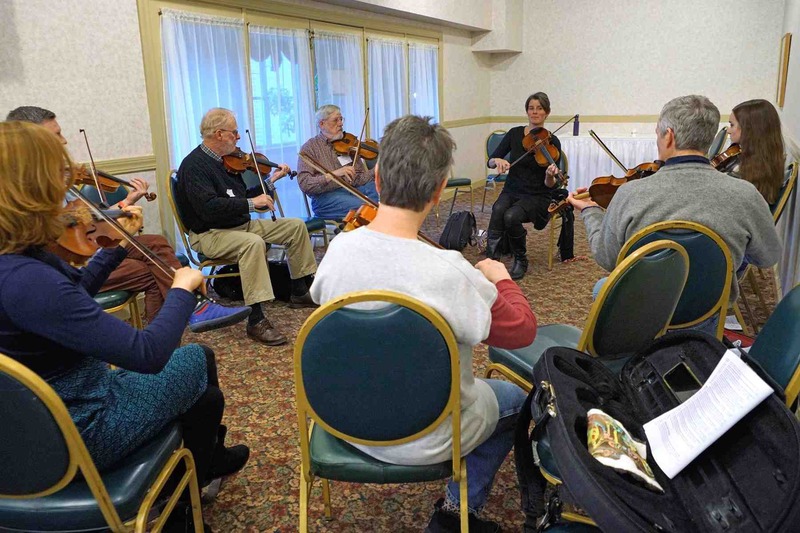 Workshops cover many different styles, and also include hands-on learning about jamming, learning tunes by ear, backing up singers and other instruments, practicing techniques, music theory, bowing shuffles, picking techniques, chop bowing, free improvisation, left hand technique, oldtime fiddling, bluegrass fiddling, oldtime fiddling, Swedish fiddling, contradance fiddling, workshops for kids, and more. 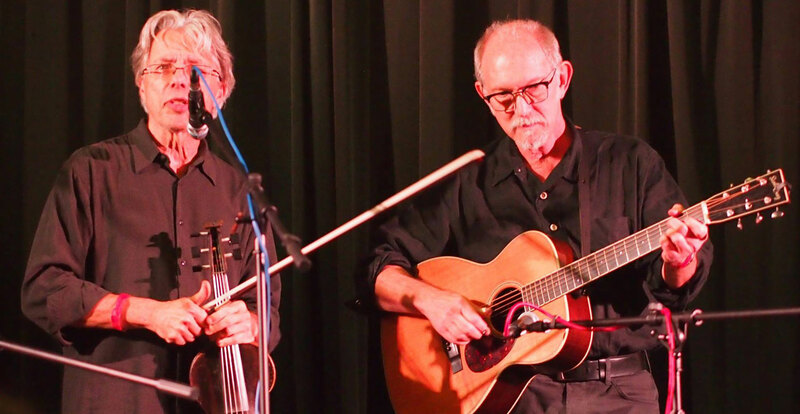 While the frequent focus is on fiddle, there will be many workshops for cello, mandolin, guitar, oldtime banjo, and singing, led by excellent players and teachers. We've also set up instructor-led jams in particular styles, like Oldtime Southern, Irish, Scottish, Bluegrass, Klezmer, Jazz, and Western Swing, and at different levels. Slow-speed tune workshops will be helpful when you're just learning some of the tunes. There will be some excellent jamming spots in the wide hallways, and it's fine to jam in the workshop rooms between sessions. We will be inviting selected local players (guitar, mandolin, banjo, bass, and more) to join in the jams. The 2018 instructors and accompanists are listed on the Staff page; we'll be updating the list for 2019 by mid-year. See the Schedule for more details on 2018 workshops, jams and concerts; 2019 will be similar in many ways (with some improvements as well). 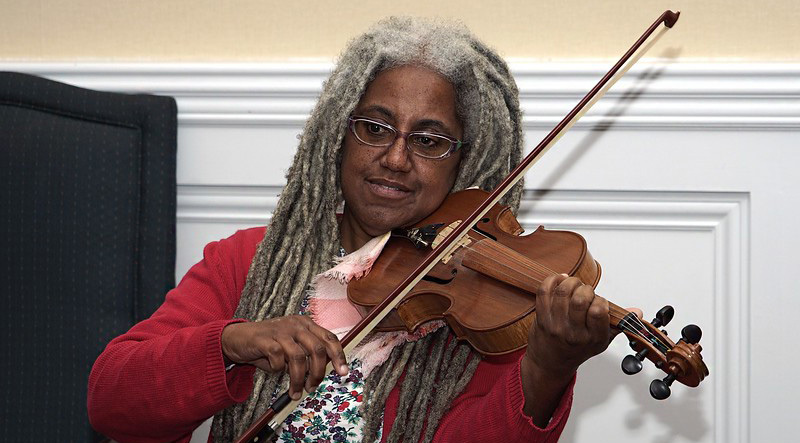 Fiddle Hell 2019 will be held once again at the Westford Regency Inn, 219 Littleton Road, Westford, Massachusetts. There's lots of workshop and jamming space, free parking, nice rooms if you wish to stay there (bookable around the end of January), and good food both onsite and nearby. Sessions, workshops, concerts, dances, and late night jams will all be under one roof! Click here and scroll down to Lodging and Food for information on booking sleeping rooms, starting at the end of January. If the Westford Regency sells out of sleeping rooms for 2019, note that there are other hotels nearby. To help with jams, to give players some common repertoire, and to encourage all to try out new styles, we introduced the "original" set of 52 common tunes in 2010, and added the "new" set of 52 more in 2016. The New 52 were chosen based on your suggestions from the prior 4 years of FH surveys. Quite a few of the New 52 will be taught in workshops in November, and will likely show up in jams. Of course, the Original 52 will also show up on occasion. These tunes are all listed here. You can order an instructional 2-CD set of the 52 original Fiddle Hell common tunes, played both up-to-speed and slowly by the Reiner Family Band. Volume 1 is only $15 postpaid (within the US) in our online Store. In 2017, the Reiner Family Band (and several talented friends) recorded the 52 new common tunes, played fast and slow. Volume 2 is also only $15 postpaid (within the US) in our online Store. There are lots of jam sessions at Fiddle Hell, both scheduled and impromptu. Click for jamming guidelines. If you attended Fiddle Hell 2018, click here to take a quick 10-question survey and help us improve Fiddle Hell! We read every response, and really appreciate your feedback. Connections: If you're on Facebook, look for the Fiddle Hell Massachusetts Festival 2019 event to see who's coming, and especially join the Fiddle Hell Massachusetts group. Follow FiddleHell on Twitter. Fiddle Hell is loosely sponsored online by the Fiddle and Alternative Strings Forum and the Fiddle Hangout. 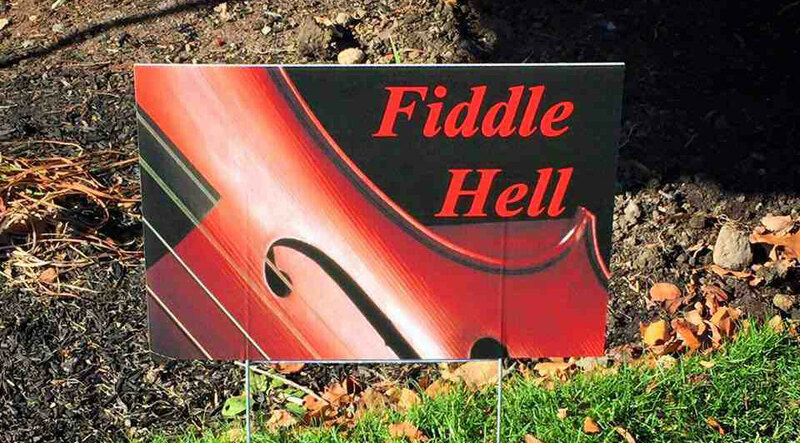 At these websites, you'll find discussions, event listings, and other resources; you can join for free and read about past and future Fiddle Hell meetings. For many years, Fiddle Hell has been sponsored by CodaBow (maker of great carbon fiber bows) and by D'Addario (maker of responsive, fine-sounding strings). During the 2018 Fiddle Hell weekend, we gave away many sets of D'Addario Helicore strings (including two sets for cello), a couple of dozen sets of D'Addario EXP74 mandolin strings, and 10 sets each of D'Addario banjo and guitar strings (lights and mediums). Right after Fiddle Hell, there was a drawing on the CodaBow website for a new Diamond SX bow valued at $625-$750 (fiddle, viola, or cello bow to match your instrument). You had a few days after Fiddle Hell to sign up for the giveaway on the CodaBow website, using a URL we gave out at Fiddle Hell. Just so you know, CodaBow asks for your email when you sign up. Finally, to one of the musicians who preregistered for the weekend, we gave away tickets to a show at Club Passim in Cambridge, and to another a $100 gift certificate from Johnson String Instrument / Carriage House Violins usable at Fiddle Hell or at their store in Newton, MA. 2019 giveaways will be very similar, although there may be a few more due to additional sponsors. P.S. #1 (from Dave) The Old Groton Inn, which had hosted Fiddle Hell Massachusetts from 2005-2010, burned down on August 2nd, 2011, fortunately with no injuries to guests or staff. The Inn was built around the year 1678. Dark but lively, full of character and history - in many ways that quintessential New England setting was just like the old traditional tunes that we played there. George (the owner) loved music, cooked with pride, and was always telling me - "We'll take care of you, buddy!" And Vicki (the manager) worked very hard, against a variety of obstacles, to make every Fiddle Hell as smooth as possible for her guests. I am very sorry for their personal loss and the historic one as well, and offer my heartfelt thanks for our years of partnership. P.S. #2 (from Dave) From 2011-2013, Fiddle Hell was hosted at Concord's historic and inviting Colonial Inn. We greatly appreciate the fine support and warm welcome Fiddle Hell received from the Colonial Inn and its staff through those three years. We have moved on to a new location since the event has now grown too large for the Colonial Inn, but we wish them well!